How can I use contacts only from my gmail account that I had used it on Android not icloude ????? Recently phone is showing contacts not exist on my gmail contacts !! !and when I save some new contacts they won't be saved to my gmail account !!! Settings --> Contacts --> I have not option to choose which one I need to choose !!!! https://support.google.com/contacts/...rm%3DiOS&hl=en here you can find how to set up gmail contacts on an iPhone. Don’t hesitate to ask if you have any other questions. You can add your Gmail contacts to iCloud. Is that what you want to do? I have no issue to setup gmail account and therefore when I setup my now iphonex contacts initially got downloaded from the gmail server. I want to delete the old contacts that they were in my icloude since 2008. Then I need to download contacts from my gamil server to the iphone X which I had already done it. I used this app to clean up my contacts between iCloud and google. It works well for me. dazzlingirl and Lee_Bo like this. More than 40 contacts you have to pay for it,,,,haven't you ? Yes. I paid the $2.99 for unlimited syncs. Well worth it. I never mind paying for a good app. Developers have to eat too. Yes. I paid the $2.99 for unlimited syncs. Well worth it. I never mind paying for a good app. Developers have to eat too. Do you want those contacts as Gmail or iCloud? You can have them either way. Shouldn't cost anything to do it. I switched my Gmail contacts over to iCloud. Works better that way on iOS. So on your iPhone in contacts, are they Gmail or iCloud? Or both? I had some that were both, but it seemed to cause issues. I finally got it where they were all only iCloud contacts. I only have the iCloud contacts turned on in settings on my iPhone. I did it wrong the first time and left both on. Boy was that a mess on both ends. I didn’t read the app instructions and ended up with duplicates everywhere. Lol. The app does say to turn gmail contacts off on your iPhone to prevent that. Worked great after I did that. If I add a contact on my iPhone it will show up in gmail after syncing and if I add one in gmail it shows up on my phone after syncing. Do you want those contacts as Gmail or iCloud? You can have them either way. Shouldn't cost anything to do it. Moving from Android to iOS I need to have them as Gmail first ? right ? when I satisfy everything in place I can switch to iCloude ? I switched my Gmail contacts over to iCloud. Works better that way on iOS. If you never plan on using gmail for contacts again then you can just move them over to iCloud and use that going forward. I use both and much prefer google services over any of the Apple services. The app I suggested does that for me. It will also help you move your contacts to iCloud and if you never want to sync them again, i believe it is free. I’d have to confirm that though. I’m thinking you pay for the sync feature but I could be wrong. It’s been a while. If you never plan on using gmail for contacts again then you can just move them over to iCloud and use that going forward. I use both and much prefer google services over any of the Apple services. Ok. Then you will want to sync. Im sorry, I’m not sure what “that app” is that you are referring. If you open gmail on your computer you will find a pull down to see contacts. I’m assuming that’s what you mean by Gmail contacts. 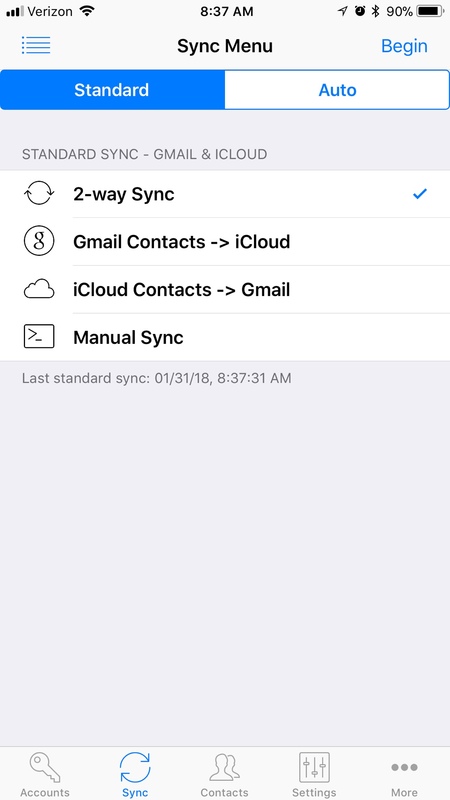 Those are same as the Contacts that would sync to your phone from gmail or the same that would appear in contacts on an android phone by default. Google has your contacts in one location. I think I’m misunderstanding your point on this one. Sorry. I have also used this and it works great. And I also have no issues paying for an app if it's something that works and that I use constantly. I’m not sure what “that app” is that you are referring. I don’t know if it matters but that post from google was from 2011. Might still be relevant, but I don’t know. I have only ever known one Google/Gmail contacts. Here is what my sync screen looks like if it helps.